xxelle - a canadian fatshion blog: big deal toronto: plus-size pop-up sale! 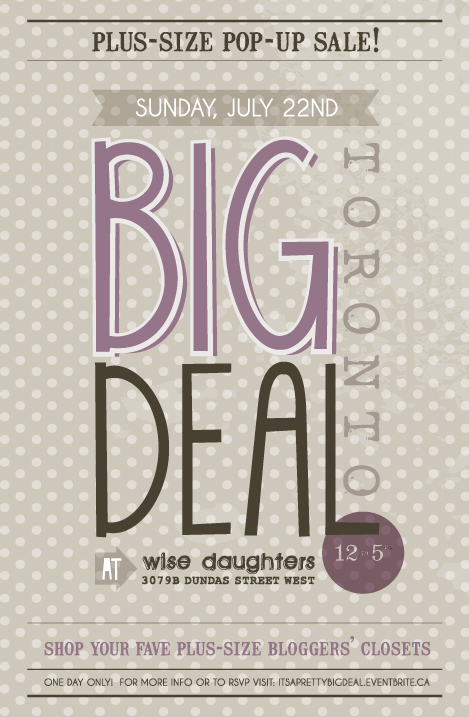 big deal toronto: plus-size pop-up sale! Shop your fave Toronto-based fatshion bloggers' closets at this summer's exclusive plus-size pop-up sale! Join myself, and fellow plus-size bloggers: Curvy Canadian, Killer Kurves, Round Raglan Road, Geek With Style, Queen Sized Flava, Ruby Nite, big hips, red lips, The Glitter Thread & Friends in my Closet for an afternoon of awesome!! Not gonna lie, it's a pretty big deal.